Some time ago I bought a polka dot bag. I loved its pattern and even though it would not match anything I had at my wardrobe, I had to buy it 🙂 After all it always can be an interesting eye-catching addition to an ordinary outfit. 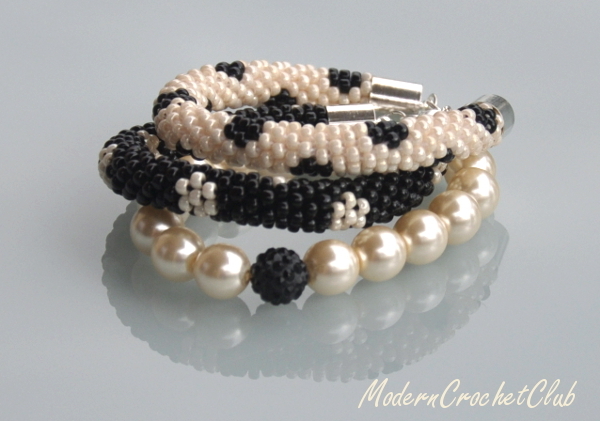 As I got back home with my new bag, I decided to make a bracelet with this pattern. I can crochet it, so why not ? I did some research to maybe get the pattern, but all I found was the bracelet with one bead dots, so had to design the pattern of my own. One is always to few for me, so I made another one in negative. 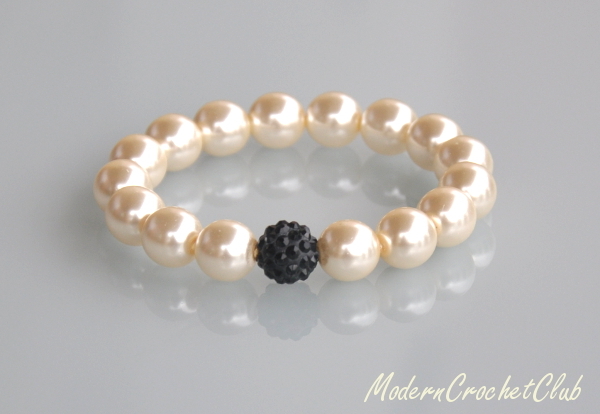 And then made matching one with glass pearls and shamballa bead. I don’t recommand this combination, because shamballa bead scratched some pearl paint from the neighbour pearls while wearing 😦 Now I would use a Swarovski crystal instead of Shamballa or add not painted glass beads between them. I am crocheting the black one, but follow the thread to find the ivory one.